Best free PDF editor: In this modern world almost everything is handled by technology. There is a need for technical assistance in almost every field of work. Technology has helped the humans in saving time and efforts through easy and simplified ways of execution. How do you store data on the computer? Data is preserved in the form of electronic files that are mostly available in readable format so that it can be shared to different people. A PDF file is the most commonly used format for official work. It is the standard file which is preferred in order to share important information. Can we edit in a PDF file? Creation of a PDF is not that difficult but when it comes to editing such a file then the user might require a proper editor. There are numerous PDF editors available online which are either free or paid. Such software helps to offer functions to correct the position, alignment, font, images or even change a PDF file into a different format.Always make sure you use a tested editor because there are several fake software programs available on the internet which might harm your data or system. People mostly search for a resource on the internet which can convert the format of a PDF file into some other editable format. For this you can refer to this amazing software called PDF Online. It allows you to create a PDF file from a word document and vice versa. So, if you wish to edit any of your PDF files then you simply have to convert it to word format and carry out the necessary changes. Once the changes are done you can again use PDF Online to convert it back to PDF format. One simply has to upload the file from the system and the software would convert it within seconds. This is one of the best free PDF editor available online. This is one of the famous online editor tools for PDF files. One can easily edit his/her PDF file online without any hassle. There are a variety of tools available at PDFEscape that makes it an effective editing destination on the internet. Some amazing features which are present with this tool are- annotate PDF documents; edit PDF files and password protect PDF content. Some other services also include PDF form design, PDF form filler and PDF reader. The user can also share his/her PDF document directly through this tool. Saving and printing option is also available with PDFEscape. This can be rated as the best free PDF editor that has variety of functions to favour the user. Have you ever heard of an editor that uses a cloud based system for editing? If not, then here is a stunning and effective editor to help the people in quickly editing PDF files without any conversion process. CutePDF Editor can easily edit your PDF document which makes it a special online tool. The user has to just upload the file and then he would be offered with functions to carry out the necessary changes. Once the editing is complete then the user can download the file back to the computer’s storage. Some interesting features of CutePDF Editor are its password and security options that help to safeguard the content. One can combine multiple PDF files into a single file or can even split a PDF file as per their convenience. There are also options available to reorder, duplicate, rotate, delete, crop and extract pages. Resizing pages can also be carried out using this tool. This is one of the smart best free PDF editor one can get on the internet. This online editing tool can offer a variety of functions on a single platform. Online2PDF is a brilliant PDF editor that can convert any PDF file into Word, Excel or Powerpoint format and vice versa. The editing functions include adding or deleting content along with merging different files into a single file. One can also unload PDFs without any difficulty. Header-Footer and page numbering can also be applied to the file using this editor. File compression and securing the content with a password is also offered by Online2PDF. The interesting aspect of this can select more than one files at a single go. The maximum limit is 20 files at a time but the size of the files shouldn’t exceed more than 100 MB. Such an editor can be utilised in offices that deal with numerous files each day. PDFzen ranks among the best free PDF editor of all time. This online tool helps the user to edit the PDF file without wasting much time. Everything is carried out online which makes the task easy. There is no need to create an account or log-in, one can simply upload the file and start editing. You can edit the content according to your wish without any restrictions. Add, delete or re-model content based on your requirement. Once the task is done then you can download the file as a PDF to be stored in the system. You can also transfer the document directly from the tool by acquiring the link and sharing it via social media or email. There are a variety of editors available on the internet but few stand out to become the best! Foxit Reader is equipped with some amazing features that make it a perfect PDF editing tool. This tool is used by most enterprises to handle their PDF documents in a proper manner. One can edit a PDF file at ease with supreme functions provided at this platform. One can convert a Word, Excel, HTML or a PPT to PDF using this tool. The reverse conversion is also available without any difficulty. One unique feature of Foxit is that it supports Optical Character Recognition. It means that one can scan the content and it would be converted directly to a PDF format. Options such as sign documents and exporting files is available with this tool. PDF protection is another impressive feature that helps to preserve the data using IRM and dynamic watermarks. Creation and fill forms are some extended features of Foxit Reader. The editing options include easy view of multiple PDF files along with bookmark support that helps to add, edit and re-model bookmarks in a document. Foxit Reader is an intelligent tool which obviously should be tagged as best free PDF editor. This particular tool is a free open source editor for PDF files. It comprises of a PDF manipulating library based on GUI, xPDF, set of command line tools and a PDF editor. A multiplatform library is available with this tool that serves to read, edit and extract date from a PDF document. The GUI helps to modify the information by scripts and plugins. This particular editor performs exquisite functions to modify the PDF file based on the user’s requirements. These advance features are of great use when it comes to high-level official information storage and retrieval. The internet is the home for a variety of software and tools that help the people to carry out different tasks. File conversion and editing is a task which can be carried out online through numerous tools. Have you ever heard of a PDF editor which can offer supreme comfort while handling a file? If not, then here it is a wonderful tool named DocHub which works excellently to edit, share and extract a PDF document without any problem. This online PDF editor has all the functions available to convert format, manage pages, draw, type and much more. PDF Form Fill is another important feature of DocHub that helps to create, edit, import and fill PDF forms. Documents can be organized systematically under this tool. A unique feature of online document signing is also offered by DocHub which is just amazing. Now the user can sign PDFs or make PDFs signed easily and that too as legally binding eSignatures. The attractive aspect of DocHub is the editor toolbar which has a dynamic form as only those functions appear which the user wants. This is a Google Integrated editor which means that one can open his files directly from the Dropbox, Gmail and Google Drive. Document security is full proof as the files are preserved under an encrypted storage. Sharing and Publishing is also very simple using DocHub. Considering all aspects, this tool holds a crowning importance when it comes to handle PDF files. There is no loss of data or other content after using this tool as it is tested and verified by the standard organizations. It is therefore counted among the best free PDF editor list. AbleWord is a small, easy and free to use word processing software that is also a PDF editor. If you wish to perform basic changes into your PDF file then you can refer this software without any hesitation. The task of editing is a simple as if you are editing a Word file. There are different functions related to formatting which can be applied to your text in the PDF document. If you are searching for the easiest and effective PDF editors then AbleWord is the best free PDF editor. Spell check is another excellent feature offered by this software. One can save the file using the Save command once the editing is done in the PDF document. There are some editing software tools which are available on the internet that are user friendly and offer easy access. They are equipped with supreme features which can help the user perform the task without any discomfort or wastage of time. One such amazing editing software is DL PDF Editor. If you want to make corrections to any of your PDF files then this is the perfect editor to choose. This is an editing software which is compatible with Windows. The benefit of using DL PDF Editor is that, the user can access multiple files in different tabs. The editing tools include inserting images, watermarks and text overlays. The software makes it easy for the user to navigate through the text by offering thumbnails of the different pages. Almost all the editing functions are provided by this software and no initial conversion to a different format is required. The changes are performed with the data retained in the PDF format. Once the editing is done then you can save the PDF file back to the system. Apart from this, there are more enhanced functions provided by DL PDF Editor. This free software for PDF file editing is not equipped with many features like other editors but it can serve useful for making basic changes. This is reliable software which is compatible with Windows. It can be accessed by any user as the interface is easy to understand. Everything is processed online which is a beneficial aspect. One can upload the file on this software and can add text boxes, text, signature, stamps etc. Once the changes are done then the user can save it to the system using the Save command. It must be counted among the best free PDF editor. There are only a few software tools available on the internet which offers quick deletion of PDF content. PDF Eraser is a smart and easy-to-use editor for PDF files. If you want to erase certain content from your PDF document then you can take the help of this tool. Following simple steps you can edit the content by deleting the waste matter and can even add text and images without any hassle. There are options available for rotating the pages so as to manage the file according to your wish. If you made a mistake during the editing process then you can also undo that step. PDF Eraser is a basic yet the best free PDF editor for such a data format. There is some software which can perform multiple functions on a single platform. LibreOffice-Draw is one such creative editor. The user can use it for editing PDF files as well. It is equipped with various tools that help to remove and add content to the PDF document. You can even add images to the file without any hassle. When the editing is done then the user has to use the export feature to preserve the edited file in the PDF format. Otherwise, the file would be saved in the LibreOffice-Draw format (ODG). You may also enjoy depth reading about deep web links. Though this software is a vector graphics editor, it can also be used as a PDF editing tool. One can easily open and edit files in PDF format on this platform. If you need to add or delete content in the PDF document then it can be performed using Inkscape. Images can also be added or deleted from the file without any difficulty. If you wish for the best free PDF editor then Inkscape suits your requirement. Text formatting can also be achieved using this medium. The best thing about this software is that, it is also available in a portable version. Most of the editing tools available on the internet are slightly complicated which makes it difficult for the users to decide which software to choose. You can now remove this confusion by opting for this simple and effective software which can be used for viewing and even editing PDF files. One needs to install ‘PDF import’ plugin so as to active PDF view and edit feature. The task of PDF editing is very basic and you would feel as if you are working on a Word file. You can make the changes in the document based on your requirement by adding or deleting text. Images can also be added to the file without any problem. This is an advance editing tool as options such as text formatting and spell check is also offered at this platform. Once the editing is done then the user needs to use the Export as PDF’ command from the toolbar so as to save the edited file in the system. Apache OpenOffice-Draw makes it to the list of best free PDF editor because of its satisfactory functioning. This is free PDF viewer software which can also be used as an editor. The tricky part is that, the text can be inserted without any difficulty but removal of the existing text requires a different approach which is tricky. One has to understand this procedure then only then can accomplish the editing task perfectly. The existing text needs to be hidden with a rectangle and colour it with white. Now the new text can be typed and placed over the shape. The similar procedure can be followed for images. The whole editing is processed on the software platform and once it is done the user can save the edited file in the PDF format. If you are in search for software that can split your PDF file then you must surely refer Icecream PDF Split & Merge software. This platform can help you manage your PDF files without any limitations such as page count. One can also merge different PDF files easily on this software. This is compatible with Windows and works effectively. The best part about Icecream PDF Split & Merge is that everything happens in a protected environment and one can also set passwords to safeguard the content. This is one of the best free PDF editor online. For the purpose of editing a PDF file one can also consider this particular software. PDFtk is an amazing tool which can be utilised to merge and split PDF files. One can segregate different pages out of a document and can even merge them based on his/her requirement. During Splitting and Merging the user is also offered with extended features as join, background, page numbering, stamp etc. If you find the need to manage your PDF files then this is a good tool to choose. This is a PDF editor that is smart enough to carry out any task. It is equipped with a variety of features that can help the user manage any PDF file. You can add, delete and extract content from the documents with ease. There are also advance tools available for rotating, cropping and compressing pages and content. The images are also converted to PDF format using this platform. 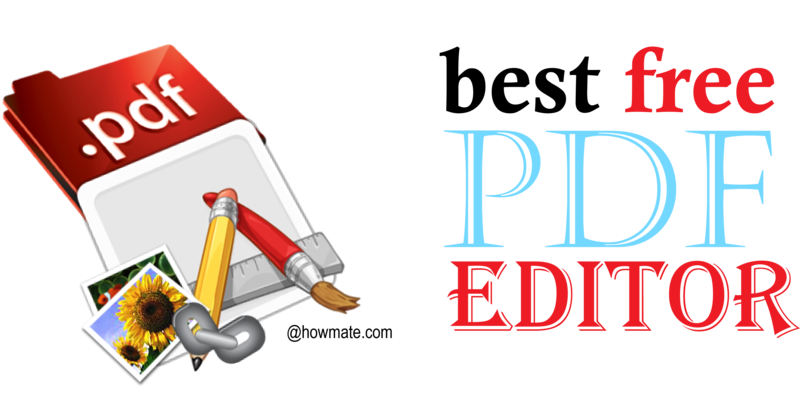 There is no need to visit any other software as almost every editing tool is available at PDFill Editor. It is indeed one of the best free PDF editor for a user to process his/her PDF file. This is software that is compatible with both Windows and Mac. One can process PDF files in order to edit text and images. The processing is carried out under a protected environment. The user can safeguard the information through password encryption. The PDF files can be converted to Word, Excel and PPT and vice versa. One can call this software as the best free PDF editor which can be accessed as ease. The above list includes some of the famous and useful best Free PDF Editor which can be used to perform almost all the editing functions in a PDF file. File conversion, text add/delete, image add/delete, page numbering, stamps, signature, content compression, formatting, page rotation, cropping and much more can be achieved with the use of these software.